Hello and welcome to the next installment of my house tour! I thought since we've been on a bathroom kick, with the bathroom remodel and all (you can check out the progress here, here, here and here), we might as well stay in theme. If you are just joining me on my house tour you can catch up by checking out the floor plans, paint colors, laundry nook, guest bedroom, kitchen, and dinning room. This room has come a long way from where it started, but I must admit it is not really my favorite. Let's take a look at what we were dealing with when I first moved in. The picture isn't great, but don't worry what you can't see I will tell you about! There was the plastic tub surround, and then around that there was almost a half inch of caulk and then a wood border/trim. Yes my shower was trimmed out with wood, probably not the smartest idea ever. The vanity was really low, like hits your thighs low with a cultured marble top. This was the first major project tackled in the house, which is partly why I think I don't really love it. I hadn't really figured out what my style was yet, and I was also on a major budget. I don't think I ever even used that tub like that, the surround was the first thing to go. Eventually everything else was replaced, well almost - you'll see what I'm talking about in a minute. The main reason I don't love it is the tile. It is this reddish brown that I found for like $.98 a square foot, but I will take that any day over the small white tiles with horribly discolored grout. You'll also notice that the wall color is very similar to the original. It was definitely not intentional. I picked out this color, after purchasing the house, but before moving in and it was sheer coincidence that the colors were so similar to one another. Lately I've been thinking that the color feels a little dark and heavy in there and have been contemplating lightening it up. We will see. The hardest part was finding a vanity for the space. I could not find a vanity that had the same width as the previous one so I was left with a gap a few inches wide on the right hand side. I would love to find a solution for the space, it's that awkward space that you can't really get into to clean but your always dropping things down. This side is nothing fancy. This is what it looks like everyday. Once of my favorite things about the bathroom are the hooks I chose to use next to the tub. They are so much easier and convenient to use than towel bars. I will forever put hooks in my bathrooms, that is how much I love them. I found the shower curtain at Target and love the soft subtle pattern. I think it nicely ties together all the colors in the room. It also keeps this end of the room light since the lighting in this room is terrible and feels like a dark cave in the shower. I found this cute bathroom art at HomeGoods. Then added the simple storage rack below from Ikea. I like that it keeps things corralled and off the top of the toilet so things aren't falling all over. Are you ready for the eye sore? The one thing in this bathroom that has not been replaced? The horrible bathroom fan. It is in desperate need of an upgrade. 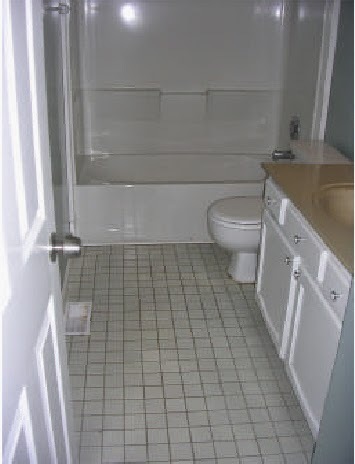 Once we complete the upstairs bathroom remodel this bathroom is going to get a little TLC. We'll replace the fan, install some crown moulding, clean up and reseal the grout and get the room looking sparkly again! Thanks for joining me on this leg of the tour! I love what you've done with your bathroom! Rooms without good natural lighting are so challenging to decorate. And I love glass jars in bathrooms to hold all the little essentials... one of my glass jars broke and I really need to replace it. It's such an easy way to make the everyday stuff look prettier!